Today, The Bahamas is an intriguing mish-mash of cultures and histories: descendants of the freed African slaves who made it their home, the European colonists’, the Puritan Eleutheran adventurers and the American Loyalists. They were later joined by people from the world over, commonly Haiti, Canada, Jamaica, Greece, China and of course an ever-present U.S. influence among our many visitors and second home-owners throughout the islands. However, it’s perhaps not surprising that the British firmly stamped their influence on this chain of islands over the course of their 256 year colonisation of The Bahamas. 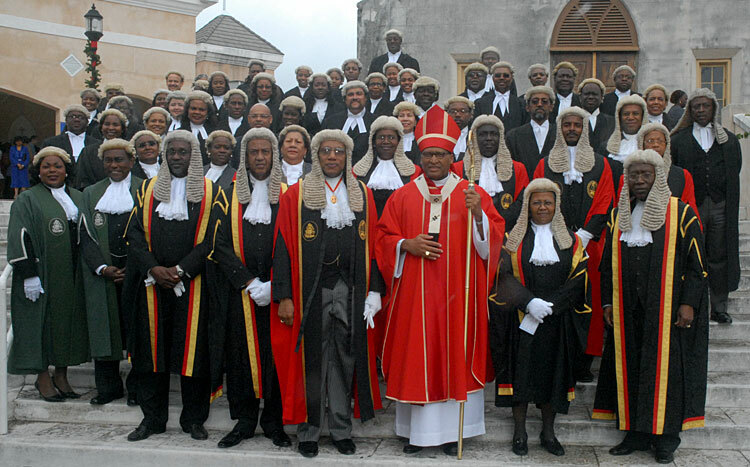 The Bahamian parliament represents one of the most lively examples of The Bahamas’ colonial history. Under this system of parliamentary democracy we adopted from our colonisers, the Prime Minister, along with other members of parliament representing each of the inhabited islands of The Bahamas, gather in the pastel pink and green-trimmed building in Downtown Nassau’s Bay Street to debate new legislation and issues of the day. Built in 1815, the parliament building – surely one of the world’s smallest – sits in an equally historic square, overseen at its centre by a statue of Queen Victoria. To the rear of the square is the Senate, where members of the upper chamber of parliament meet, while behind the square is a selection of key court buildings, including the Supreme Court. Hang around here and you might spy a judge or two emerging from their chambers, still wearing the traditional robes and the white curly wigs they put on while presiding over court matters. Visitors keen for a closer look into the inner-workings of Bahamian governance are welcome to go inside parliament and take a seat in the chamber when in session, though rules on formal attire apply. High Tea at Government House – if only for its quirky delightfulness and chance to peek behind the curtain, so to speak, into one of the most distinctive and charming relics of British colonial history in The Bahamas. Our Bahamian Governor-General, Dame Marguerite Pindling resides in the splendid pink and white building that sits on top of a hill overlooking Nassau harbour and although the country’s first lady has few formal powers, she does throw a mean tea party. Join the Governor, along with other visitors, at this free event which adds more than a dash of local flair to the traditional British “high tea”, including local bush teas, live music, Androsia fashion shows and a mix of locally adored pastries. Tea parties are organised by The Bahamas Ministry of Tourism and are held from in the afternoon on the last Friday of each month, January to November. Contact the People-to-People program for further details, as time are subject to change. If Government House isn’t throwing a tea party during your visit, take a trip to the One and Only Ocean Club on Paradise Island. One of the world’s most exclusive private resorts, visitors are welcome to join in with high tea in what was once a grand colonial home’s reception hall – today the resort’s classy Library lounge. Starting at 3:00pm, hotel staff will serve tea and gourmet treats on a three-tiered sterling silver tray. Indulge in a variety of scones, decadent petit fours, clotted cream, pastries, and delicate finger sandwiches. Vistas of the spectacular Paradise Island beach are free. For an added display of colonial heritage at its most melodious, check out the Changing of the Guard ceremony that takes place at Government House every second Friday throughout the year at 11:00am – 12:30pm. We recommend calling ahead to confirm dates and times: (242) 322-2020. A tradition since 1958, reminiscent of the changing of the guard that takes place at Buckingham Palace in London, the animated display features members of the Royal Bahamas Police Force Band and the Royal Bahamas Defense Force Officers jamming away military-style on drums and brass while dressed in their smart white, red, navy and green colonial-style uniforms (in some cases accented with a spot of leopard print). Marching band entertainment steeped in tradition at its best we say! This 102 foot, 66 step staircase was carved straight into limestone in 1793. Today the iconic scene is more likely to feature in wedding photos or visitors’ Insta snaps, but back in the day it had a more important purpose: the staircase served as a shortcut to the protective Fort Fincastle in case of an attack upon Nassau by approaching marauders. The building of this staircase did take a while- and a lot of coerced labour accomplish. Specifically, six hundred slaves spent over 16 years to hew the steps out of the limestone by hand. Today, visitors enjoy the tranquility and coolness of this tucked-away downtown treasure, and the view over Nassau Harbour with which they are greeted when they reach the top. Meanwhile, though her direct reign over The Bahamas may long be over, Queen Victoria is still very imposing as she sits in her throne overlooking Rawson Square, which is edged by the parliament and senate buildings, off Bay Street. It is said the statue of the former Queen was constructed in 1905 using funds donated by an adoring public. Today the statue shows the wear of a salty climate but the ex-monarch still puts on an impressive display and provides an excellent backdrop for some historic selfies. Hashtag #QueenVee! Another representation of our colonial heritage can be found in one of The Bahamas’ most decadent and desired desserts: Guava Duff! (Ladies consider this- Bahamian-born basketball champion and model Rick Fox claims the dessert is the way to his heart!). A potent combination of soft, sweet dough and the local guava, an indigenous fruit that preceded the arrival of explorer Christopher Columbus in 1492, Guava Duff is made using a unique dough steaming method (or “duff” as we say) that is very similar to that used by the Brits to make their famed Sticky Toffee Pudding. However, this traditional Bahamian recipe also employs a special rum or brandy butter sauce, drizzled on top of the spiralled fruit dough that is no less than sinful! No mean feat to prepare, this sweet delight is often saved for special occasions – and a holiday certainly counts as one of those. This is well worth forgetting any diet you might be on for, just trust us on this. Try a traditional version at the local Fish Fry’s Twin Brothers restaurant, single-serving order to go at Swiss Pastry Shop or a Guava Duff with a twist at downtown favourite Lukka Kairi. Even better- make and eat your own divine guava duff in our Private Authentic Bahamian Cooking Class Experience! Balcony House is an unassuming treasure right in the heart of Downtown Nassau. Those who have participated in our Bites of Nassau Food Tasting & Cultural Walking Tour will have received the lowdown on its significance as Nassau’s oldest standing wooden residence, as well as what it holds behind its tiny white and pink shutters and quaint clapboard exterior. But in order to really appreciate the value of this gem it is necessary to step inside. Free tours Monday to Friday guide you through the life and times of two of its famous residents. First- The Bahamas’ first Black member of parliament, Stephen Dillet, who was originally from Haiti and went on to win seven (7) consecutive elections after his first historic win. Dillet bought the house in 1841 at when it was already around 65 years old. Later, idiosyncratic American heiress, Josephine Bryce, bought the property. With her acquisition, the historic home was the focus of several quirky stylistic changes, including a purely purple-themed bathroom. It also once had Bond author, Ian Fleming – whose 1965 blockbuster, ‘Thunderball’ was partly filmed in The Bahamas – stay in the guest bedroom, at Mrs Bryce’s invitation. The stories of these two very different owners, as well as general historic information, are relayed with reference to the unique and beautiful furnishings and objects that still reside inside the house today, including a beautiful staircase from the inside of a ship. One of Nassau’s best-preserved examples of colonial architecture and debonaire lifestyle is Jacaranda House, located in among what was once one of Nassau’s most prestigious and glamorous neighbourhoods. The delightfully maintained and elegant home dating back to 1840 now opens its doors for select public and private events, including evocative and sophisticated Sunday Jazz at Jacaranda by the poolside. Though it has lived through periods of expansion and modernisation, this eye-catching site remains essentially the same as it was when it was first constructed by Chief Justice of The Bahamas, George Anderson over 150 years ago. In the 20th Century, the property was acquired by Lady Eunice Oakes, the widow of of multi-millionaire Sir Harry Oakes, an influential American-born, British Canadian gold mine owner, entrepreneur, investor and philanthropist, whose mysterious death in The Bahamas in 1943 has inspired all manner of intrigue. Speaking of jazz- you can experience it every Tuesday and Thursday evening at the British Colonial Hilton hotel on Nassau’s Bay Street, originally established in 1901 by Henry Flagler (also the man behind the iconic Breakers Hotel in South Florida). Throughout the 1800s and 1900s this hotel played host to royalty and more, a tradition that continues today, with the more recent visits of Prince Harry (2012) and their Royal Highnesses, Prince Edward, Earl of Wessex and Sophie, Countess of Wessex (2016).